Abraham Lincoln: "I was born Feb. 12, 1809, in Hardin County, Kentucky. My parents were both born in Virginia, of undistinguished families--second families, perhaps I should say. My mother, who died in my tenth year, was of a family of the name of Hanks.... My father ... removed from Kentucky to ... Indiana, in my eighth year.... It was a wild region, with many bears and other wild animals still in the woods. There I grew up.... Of course when I came of age I did not know much. Still somehow, I could read, write, and cipher ... but that was all." 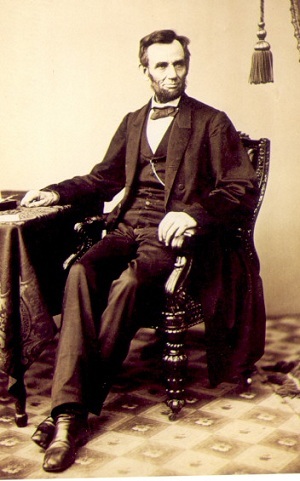 Abraham Lincoln was the sixteenth President of the United States (1861-1865). In addition to almost supernatural leadership sklls, he possessed a keen wit and wisdom that we can all benefit from today.